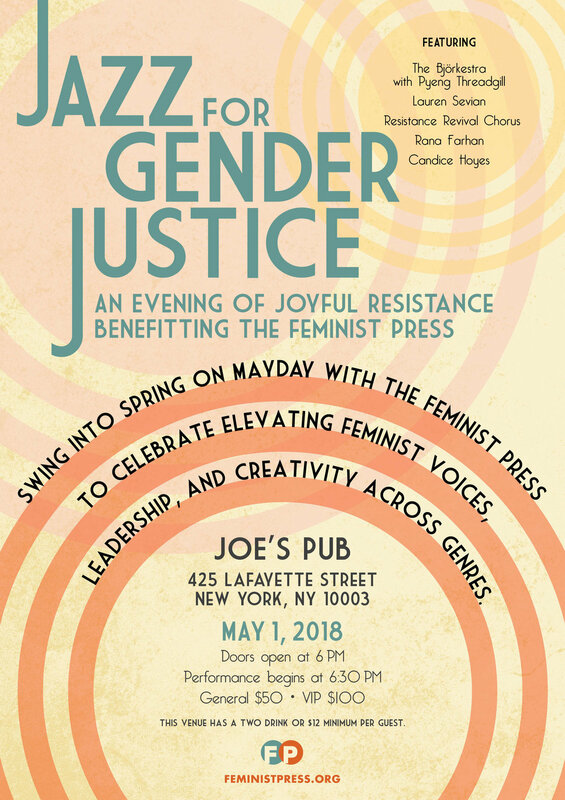 Swing into Spring this May Day and celebrate feminist scholarship, leadership, and creativity with an evening of jazz performances across genre! Joining the press will be Travis Sullivan’s Bjorkestra, a genre bending jazz orchestra that interprets the music of Bjork, Pyeng Threadgill, a jazz singer who combines music and movement, Candice Hoyes, internationally acclaimed vocalist, Lauren Sevian, Grammy award winning saxophonist, Rana Farhan, contemporary Persian jazz artist, and the Resistance Revival Chorus, a Women’s March–born collective of more than 60 women who sing protest songs in tribute to the historical importance of music in the protest movement. The Feminist Press is an educational nonprofit literary publisher founded to advance equality and amplify feminist perspectives. The 48-year-old press publishes a wide array of books including works in translation, first time authors, memoirs, and academic texts. The press also holds an annual contest enttiled The Louise Meriwether First Book Prize. Founded in 2016, the prize honors the legacy of Louise Meriwether by publishing the debut work of a woman or non-binary author of color. YZ Chin’s Though I Get Home was awarded the inaugural prize and was released in April of this year. Amethyst Editions, a Feminist Press imprint, champions queer writers who write about American LGBTQ+ experiences beyond the coming out narrative. The imprint is curated by artist and author Michelle Tea.